We must start the procedure to Save our actual File. We select the File tab in order to move to Backstage View and then from the drop-down menu we select the Save As category. The Save As dialog box appears as shown below. First, we must select the Location where we want the File to be Saved. Then we must type in a name as a File Name for our Document. We can also change the File Type of the File if we want, by selecting the Save As Type command. Finally, in order for our Document to be displayed as a Thumbnail in a Windows Explorer, we must activate the check box at the left of the command Save Thumbnail. Once we have done all the adjustments needed, we press the Save button which is located at the bottom right corner of the Save As dialog box. In the image below, I have navigated to the Windows Explorer where I saved the Document before. 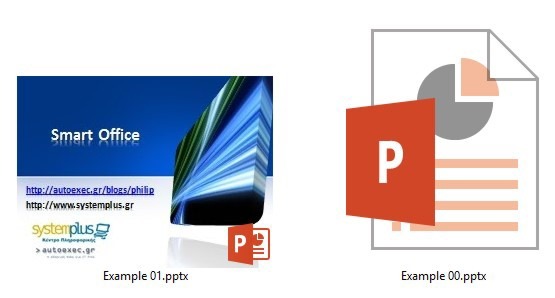 In the first image, we can see that our Document has been saved as a Thumbnail, and at the second image we can see a preview of a Microsoft Word Document. The Save As dialog box appears as shown below. First, we must select the Location where we want the File to be Saved. Then we must type in a name as a File Name for our Spreadsheet. We can also change the File Type of the File if we want, by selecting the Save As Type command. Finally, in order for our Spreadsheet to be displayed as a Thumbnail in a Windows Explorer, we must activate the check box at the left of the command Save Thumbnail. Once we have done all the adjustments needed, we press the Save button which is located at the bottom right corner of the Save As dialog box. In the image below, I have navigated to the Windows Explorer where I saved the Spreadsheet before. 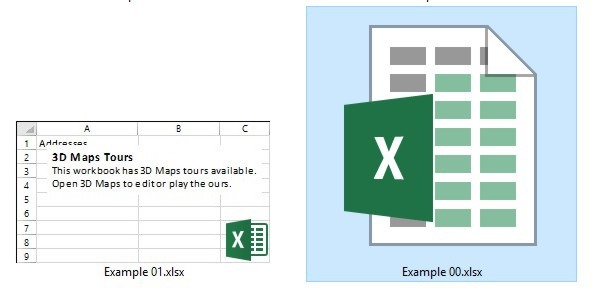 In the first image, we can see that our Spreadsheet has been saved as a Thumbnail, and at the second image we can see a preview of a Microsoft Excel Spreadhseet. For Microsoft PowerPoint applications, there is no need to do anything in order for our Presentation to be displayed as a Thumbnail. If we create a Blank Presentation and save it, we will just have a preview of a Microsoft PowerPoint Presentation, where we can see in the second image below. If we fill in any information in our Presentation, we will have available a Thumbnail Preview of our Presentation. 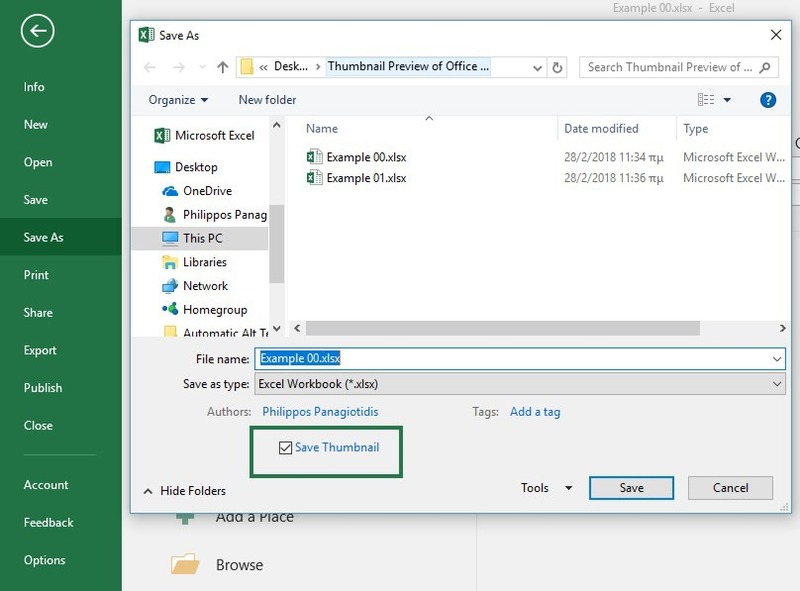 Below you can check out the video describing How To Generate a Thumbnail Preview Of Microsoft Office Applications. Don’t Forget To Subscribe To My YouTube Channel!!! 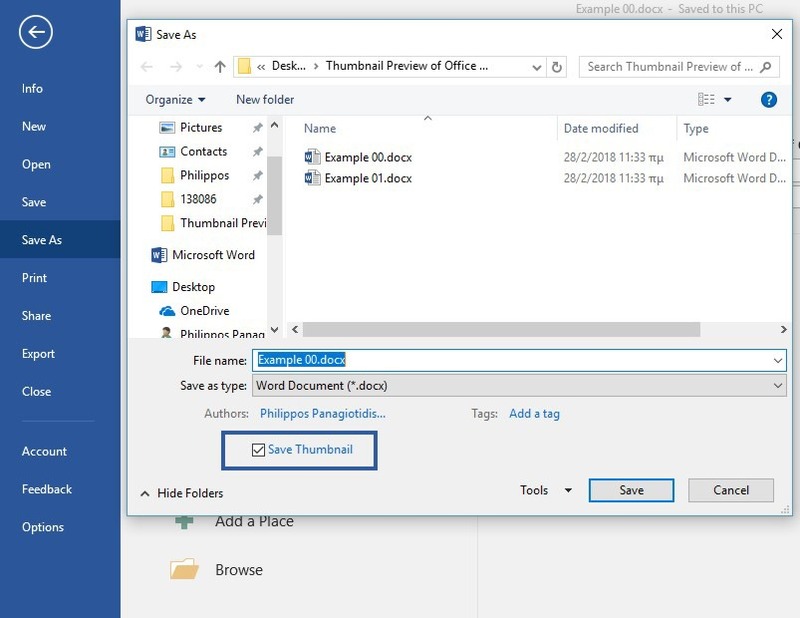 Posted on March 19, 2018, in Microsoft Office 365 ProPlus English, Office 365 English and tagged Blank Presentation, File Name, How To Generate a Thumbnail Preview Of Microsoft Office Applications, Location, Microsoft Excel Spreadsheet, Microsoft Office, Microsoft PowerPoint Presentation, Microsoft Word Document, Office Smart, philippospan, Save As, Save As Type, Smart Office, Spreadsheet, Subscribe, Thumbnail Preview, Windows Explorer, YouTube Channel. Bookmark the permalink. Comments Off on How To Generate a Thumbnail Preview Of Microsoft Office Applications.